With the aid of his clandestine patron Thomas Jefferson, Scottish "scandalmonger" James Callender launched a print campaign against President John Adams that would make the election of 1800 one of the nastiest in history. Jefferson first read Callender's work in Europe; he admired and enjoyed a scurrilous attack on the British constitution that Callender had written while still in his native Scotland. In 1793, wanted on charges of sedition, Callender and his poison pen took flight to Philadelphia and its unapologetically partisan press. Callender presented himself to Jefferson as someone willing to scourge Adams' Federalist Party in print, for a price. Callender had already begun an exposé of Alexander Hamilton and, with Jefferson's financial assistance, completed his attack on the Federalist leader. In 1797 Callender published news of the Treasury Secretary's adulterous affair with a married woman (a charge to which Hamilton confessed). In addition he charged that Hamilton had subsequently attempted to silence the woman's husband with insider secrets and treasury funds, a charge that Hamilton vehemently denied and that was never proven. In the wake of Callender's sordid revelations, Hamilton never again held a civil office, though he served as Inspector General in the Provisional Army raised during the Quasi-War. Callender's attacks on Hamilton paled in comparison to the calumny that he directed at Adams, which amounted to character assassination. In 1799, bankrolled by Jefferson and acting as the editor of the Republican Richmond Examiner, Callender began work on The Prospects before Us. Dredging up the pro-monarchy charges that always dogged Adams, Callender accused the president of being "mentally deranged," planning to crown himself king, and grooming John Quincy as his heir to the throne. Adams was a "hideous hermaphroditical character, which has neither the force of a man, nor the gentleness and sensibility of a woman." Adams, alleged Callender, had brought about The Quasi-War crisis with France through his own "steadfast antipathy" toward the former ally. In other words, Adams' reelection would result in war; Jefferson's election would ensure peace. In publishing The Prospects Before Us, Callender flagrantly violated The Sedition Act. He was jailed in Richmond for nine months, but he didn't mind, bent as he was on reward and martyrdom. 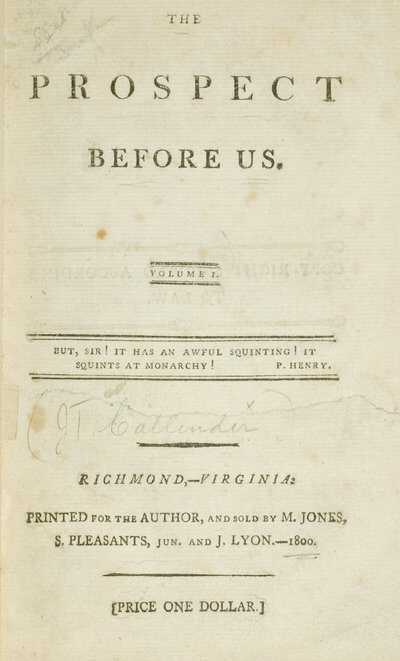 Jefferson had been impressed by the smear campaign and wrote, "Such papers cannot fail to produce the best effects." 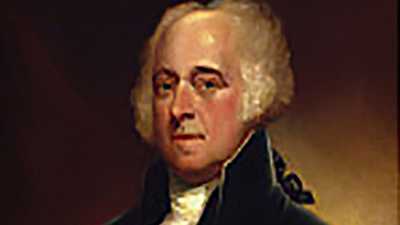 In 1800 Adams lost his bid for reelection. Once President Jefferson was in office, he pardoned Callender and others who served time as a result of the Sedition Act, which expired on the last full day of Adams' term in 1801. Callender, however, desired not just a pardon, but an appointment as postmaster of Richmond. Jefferson now had little use for Callender and denied his request. Callender threatened to go public with secrets Jefferson would prefer not revealed. Through an intermediary, Jefferson's secretary Meriwether Lewis, Jefferson gave Callender $50. 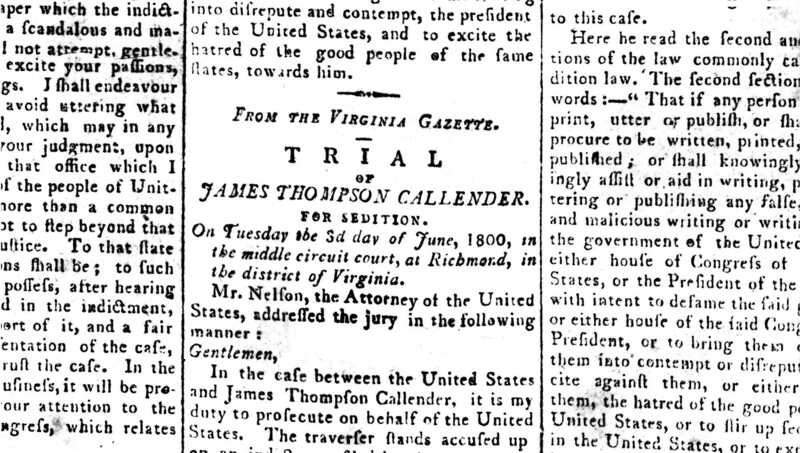 The scorned Callender went to work for Richmond's Federalist paper, the Recorder, where he revealed that Jefferson had subsidized his campaign against Adams. He quoted Jefferson's letters as proof. Jefferson said only that his "charity" had been misconstrued. The increasingly enraged Callender next committed to print what had long been the subject of gossip: the story of Jefferson's long affair with his black slave, Sally Hemings, the "African Venus." "By this wench," wrote Callender in "The President Again," "our president has several children. There is not an individual in the neighborhood of Charlottesville who does not believe the story, and not a few who know it. ..."
Jefferson chose not to respond to the charges publicly. Adams held his silence as well. 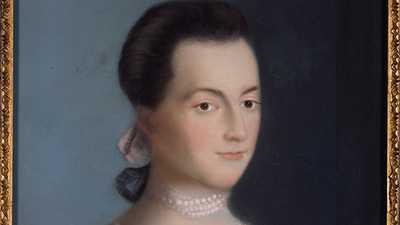 But Abigail Adams revived her correspondence with Jefferson to deliver her own blistering attack on his character, accusing him of "the blackest calumny and foulest falsehoods." Jefferson's denial of any involvement with Callender fell on deaf ears. In 1803, drunken and destitute, Callender drowned in three feet of water by the shore of the James River in Virginia. 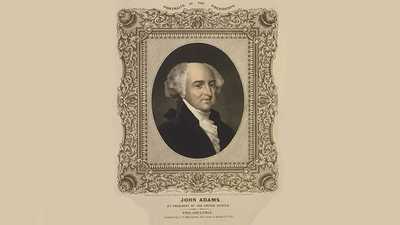 In history's view, Callender's libelous writings would not leave nearly as great a blight on Adams' reputation as would Adams' own passage of the Sedition Act. Like young girls of her time, Abigail lacked a formal education, but from youth she was intelligent, well read, and outspoken.